This is a prime lens manufactured by Tamron and the model was launched 2008. The lens has a traditional filter thread on the front and its measuring 55 mm which also the filter you will use must have. If you use for example an UV filter can be a cheap insurance against scratches and dust. If you buy this lens it will come with a lens hood, whose model name is "2C9FH". Text from Tamron: "Tamron´s 90mm macro lens that is world renowned for its outstanding optical performance and lightweight and compact design, has been redesigned to feature ”Di” (Digitally Integrated) design. The SP AF90mm Macro, first introduced in 1979, underwent a major model change several years ago to achieve 1:1 macro capability. Even with that change, the lens has remained one of the most highly acclaimed lenses in the world as ”the best buy” for more than two decades since 1979. Now the lens has further evolved into a new macro lens that can be recommended for use with film as well as digital SLR cameras. 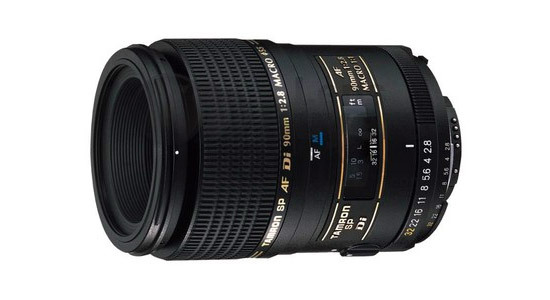 The legendary 90mm F2,8 has been available in different improved versions for over 30 years, and therefore stands in a long macro tradition in the super performance series. This light super performance ( SP)* macro-lens offers a 1:1 magnification ratio and pin-sharp images with beautifully blurred backgrounds that make your subject stand out. The Di version was adapted to the demands of digital SLR cameras and characterized by a new multi-coating with which the stray-light behavior of the lens was optimized. The Tamron 90mm is often called the ”portrait macro”, because the focal length is also ideally suited for portraits. The new version can be also be used on full frame or 35mm cameras. * SP ( Super Performance) - This lens belongs to the Super performance ( SP) class of Tamron lenses distinguished by ultra high optical and mechanical quality. Please note: The 90mm is now available with a built-in motor for the Nikon D40, D40X and D60 (Model A272NII). The 272EN model which had been available up until apx. February 2008 is only compatible with the D40/D40X/D60 in the MF mode due to the fact it doesn´t have a built-in motor. The SP 90mm F/2.8 Di enjoys enviable DNA from Tamron´s original SP 90mm F/2.8, further refined for the demands of high-resolution digital imaging. Extraordinary 1:1 (life-size) close up capacity, combined with what many consider an ideal portraiture focal length (when used on full-frame DSLR or 35mm SLR cameras) this prime optic was nicknamed ”the portrait macro.” Equally at home on APS-C DSLRs, rendering a picture angle equivalent of the 140mm lens on a full-frame DSLR or 35mm SLR camera, photographers appreciate the resulting increase in front element-to-subject distance and close-up photography. In addition, this 135mm-like picture angle is well-suited for environmental portraiture. Extraordinary sharpness, striking contrast and a remarkable absence of distortion combine to produce images of exceptional caliber."